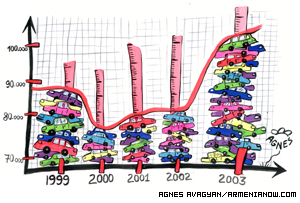 The number of vehicles registered in Yerevan in three-fourths of this year shows a dramatic increase over the number registered in an entire year only five years ago. Family of Tigran Naghdalyan and defendants in his murder trial have had their final say and it is now up to Judge Saro Aramyan to render a verdict within the next 10 days. Naghdalyan, the chairman of the Board of Directors of Armenian Public Television, was shot to death last December 28. Arsen, 11, and his brother Andranik, 12, used to go to Yerevan from Parakar to beg for money to save their family from hunger. They had not been to school for two years because their single-mother Narineh could hardly provide food for her four sons and could not afford other expenses. The good news just doesn't stop. "A society existing within the limits of fear can't have hope for independence. But we must have hope. For the struggle, we have to make sacrifices and suffer." Four-year old Nina is quietly sitting on a chair, looking blankly around her environment. Teacher Erna Shagoyan, a specialist for the deaf and dumb, steps behind her and starts shaking a plastic box full of buttons and stones, and Nina's face comes alive. The prospect of new legislation placing restrictions on Armenia's various lottery games has increased the popularity of the games throughout Yerevan, as lottery promoters try to capitalize on the gambling craze before facing tighter limits on their availability. Excavations in the Yerevan district of Shengavit over the past two years have uncovered a city which local and some foreign archeologists believe to have been settled five thousand years before the birth of Christ. Scientists say the site has yielded some of the archeologically-richest finds in all the Caucasus, and if the dating proves accurate, it would mean that the area was settled nearly 4,000 years before the Urartus founded Yerevan. Norayr Stepanyan of Yerevan took the Grand Prize in horse riding-jumping competition in Tbilisi. About 70 horsemen from Georgia, Azerbaijan and Armenia competed October 25-30 in the Caucasus Cup Competition. Russia's Minister of Defense, Sergei Ivanov (smoking left) and Armenia's Minister of Defense Serzh Sargsyan (smoking right) blew smoke together this week during a visit to the Genocide Monument.